Win a WP7 HTC Radar! Each year, Microsoft conducts the Global Relationship Study (GRS), an initiative which forms part of our ongoing efforts to ensure that we meet our customers’ needs and help Tech Students like you to have a better experience with our products. To help us determine how we can further enhance our relationship with you, we invite you to participate in the ongoing Global Relationship Study. From March 20 to April 13, 2012, you may receive an email invitation from Microsoft Feedback (feedback@e-mail.microsoft.com), containing a link to the online customer satisfaction survey. How Do You Get the Chance to Win an HTC Radar WP7? What’s more, by joining the survey, you may just be a few clicks away from winning an HTC Radar WP7! To qualify for the raffle, simple send the screenshot of your accomplished survey form to acadph@microsoft.com. Winner of the HTC Radar WP7 will be announced by May 3, 2012 and the prize may be claimed by May 15, 2012 at the Microsoft Philippine Office, 8F 6750 Ayala Office Building, Ayala Avenue, Makati City. 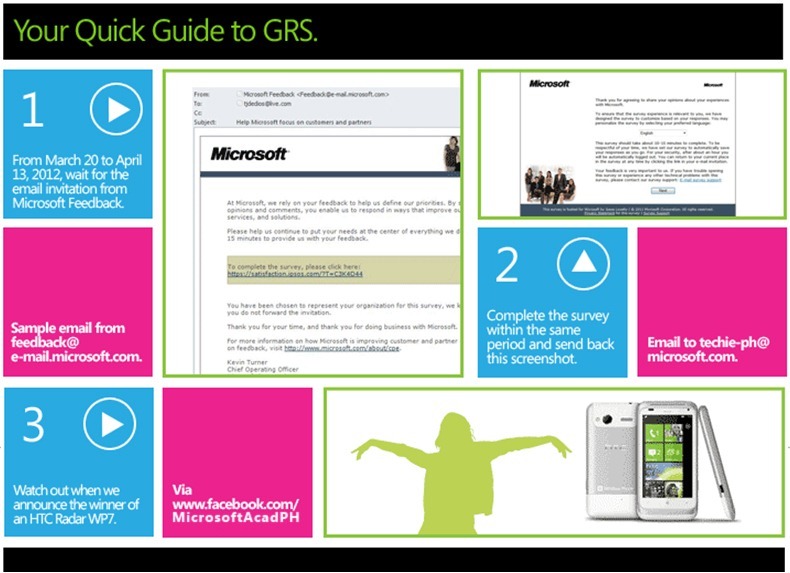 See our Quick Guide to GRS below for the steps on how to be eligible for this program. In the meantime, we thank you in advance for your participation and valuable input!